Columbus Yachts is hosting a a broker open house on the new Columbus 40S Hybrid, the new 40m motor yacht in Port Hercules, Monaco on 18 December from 1pm until 7pm. Built in aluminium, she was launched in early September 2013 at the Palumbo yard in Naples and made her debut at the recent Monaco Yacht Show. 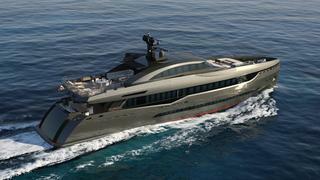 She features naval architecture, exterior styling and lines by Sergio Cutolo of Hydro Tec, while the interior design is by the yard team in collaboration with Italian studio Hot Lab and the owner. Forward on the main deck the owner’s suite features an office, large dressing room, and forward an en suite with a huge double-head shower. There are two guest cabins and an aft VIP cabin on the lower deck – this can be turned into two cabins by pulling a sliding screen through the middle of the cabin and pulling a bed down from the wall of the cabin’s sitting room. Throughout the yacht the colour palette is neutral, with browns, creams and whites. Fitted with two diesel and two electric engines, the yacht can be operated as a conventional diesel vessel or a hybrid diesel electric one and as a third option can be all-electric power. The Columbus 40s Hybrid motor yacht is featured in the January 2014 issue of Boat International magazine.